The inspired singing of Christmas carols by the Thomanerchor Leipzig, attracts large congregations to the church every Christmas. The present CD documents this long tradition. Georg Christoph Biller, the sixteenth Thomaskantor since Bach, has assembled the program on a theological basis: first come Old Testament prophecies of the coming of the Messiah, which is finally celebrated musically by the entire congragation. 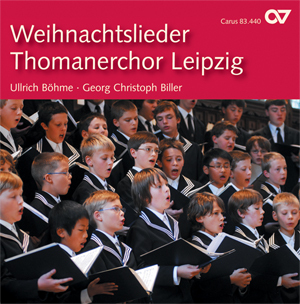 Along with well-known carols such as "Macht hoch die Tür", "O du fröhliche" and "Stille Nacht" the less familiar Christmas songs in this recording bring attractions of their own, and they enable the listener to take part in the Christmas carol singing of the Thomanerchor Leipzig.